A gentle, botanical & sulfate free shampoo with Sapayul oil from the tropical rainforest, the ancient Mayan beauty secret. Rainforest Babassu, Rice Protein, Vitamin B-5 and specially selected botanicals help strengthen and condition to leave your hair shiny & soft. New! Citrus Blossom﻿ scent is pleasantly uplifting with zesty Grapefruit and sweet Orange essential oils. Botanical shampoo features . . .
Key ingredients: Sapayul oil, Babassu oil, Rice Protein, Vitamin B-5, Vitamin E, Passion Flower Fruit extract, Slippery Elm bark & botanical extracts of Mimosa & Chrysanthemum. An everyday lightweight botanical formula with rainforest Sapayul for gentle conditioning. Babassu, Sunflower, Olive and Coconut oils add moisture and enhance combability, body and shine. Rice protein, Panthenol (Vitamin B5) and select botanicals help build strength and elasticity for healthy, more manageable hair. New! ﻿Citrus Blossom﻿ scent is pleasantly uplifting with zesty Grapefruit and sweet Orange essential oils. Botanical conditioner features . . .
Key ingredients: Sapayul oil, Babassu oil, Sunflower oil, Rice Protein, Panthenol (Vitamin B5) and Passion Flower Fruit extract. Our botanical Moisturizing shampoo with Sapayul oil is perfect for dry, damaged or color treated hair. Infused with hydrating tropical oils Babassu, Kukui & Macadamia, plus Shea Butter, Aloe, Vitamin E and specially selected botanicals, help moisturize and gently cleanse, leaving hair soft, shiny and full of body. New!﻿ Lavender Mint scent is calming and refreshing with Lavender and Peppermint essential oils. Moisturizing shampoo features . . .
Key Ingredients: Sapayul oil, Babassu oil, Kukui nut oil, Coconut oil, Shea Butter, Passion Flower Fruit & botanical extracts of Mimosa and Chrysanthemum. Our botanical Moisturizing conditioner with Sapayul oil is perfect for dry, damaged or color treated hair. Infused with hydrating tropical oils Babassu, Kukui & Macadamia, plus Shea Butter, Aloe, Vitamin E and specially selected botanicals, help moisturize and conditioner, leaving hair soft, shiny and full of body. Moisturizing conditioner features. . .
Key Ingredients: Sapayul oil, Babassu oil, Kukui nut oil, Coconut oil, Macadamia oil, Shea Butter, Aloe, Passion Flower Fruit & botanical extracts of Mimosa and Chrysanthemum. 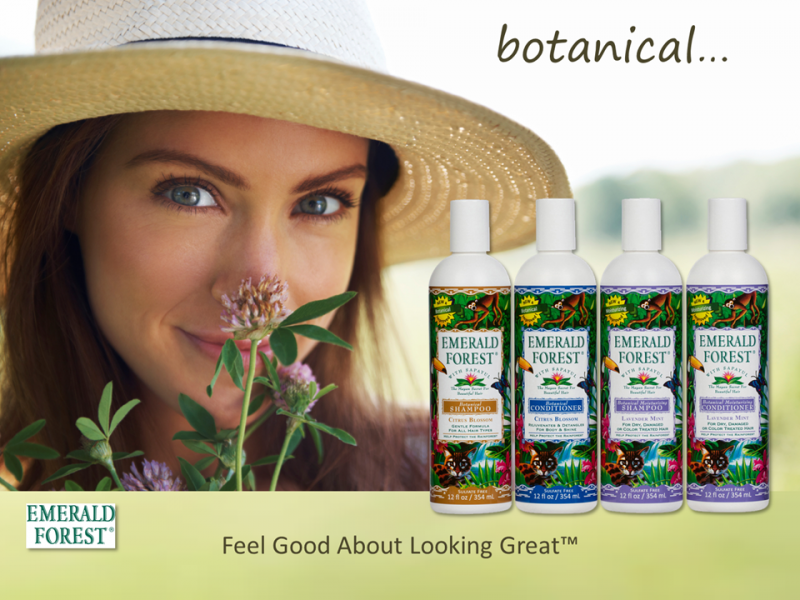 "Emerald Forest makes my coarse hair soft & shiny"
"I've been using the conditioner for over 15 years"
Information and statements regarding Natural Tropix products have not been evaluated by the FDA. Natural Tropix products are not intended to diagnose, treat, cure, or prevent any health condition or disease. Copyright 2009-2018 Natural Tropix Corporation. All rights reserved.